There is no better way to show your patriotism than by shopping at AmericanFlags.com. You can find American flags for the outdoors, indoors, classrooms, and cars as well as handheld and stick flags at AmericanFlags.com. World flags, religious flags, state flags, garden banners, political flags, and fire and EMT flags, and city flags are also sold at AmericanFlags.com. There are patriotic gifts, hats, caps, pins, decals, patches, and patriotic art on sale at AmericanFlags.com as well. RetailSteal.com has the best AmericanFlags.com coupon codes, AmericanFlags.com discounts, AmericanFlags.com coupons, and AmericanFlags.com promo codes. Shipping and handling rates at AmericanFlags.com depend on the pricing of your purchase and your shipping destination. See website for full details. Exclusions may apply. Buy select Verona Brand Stick Flags, and pay only 50 cents at AmericanFlags.com. Click link to buy. At AmericanFlags.com, pay only $10 for military caps. Click link to buy. Buy NFL Football flags for as low as $10.90 at AmericanFlags.com. Click link to purchase. Buy Betsy Ross flags for as low as $12 at AmericanFlags.com. Click link to purchase. Pay only $19.90 for an American Garden Flag Banner and Bracket set at AmericanFlags.com. Click link to buy. 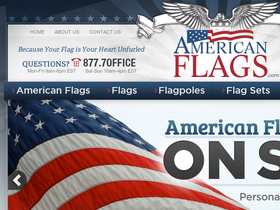 At AmericanFlags.com, buy a Wood Pole American Flag Banner set and pay only $$29. Click link for savings.